It’s recommended that if someone is under the age of 40 years old and does not have a will, now is the time to do it. For first responders in Lafayette, Louisiana, an opportunity to probate a will has just been granted. According to KATC, the Lafayette Bar Association plans on organizing an event to help first responders craft legal wills. Volunteer attorneys working alongside the Wills for Heroes Foundation and the Louisiana State Bar Association will draft wills for first responders in Lafayette parish for no cost at all. The event will take place on June 16 from 10 a.m. until 1 p.m. and first responders and their spouses will be able to sit-down with a volunteer attorney and discuss future plans. “This event is a free serve to our first responders as a means to give back to those who protect us and our community,” a spokesperson said. These will and testaments, no matter when they were drafted, need to be handled with care and securely kept for an entire lifetime and then some. According to the Gartner Group, 15% of all paper documents are misplaced and another 7.5% of paper documents are lost completely. Losing a will can have a catastrophic impact on an entire family. If a person planned on passing down his or her assets and dividing up the estate, without a will, all of that money and property could be acquired by local or federal governments. So what happens if someone passes away and his or her will is missing? According to Law Free Advice, as long as there is an earlier will that hasn’t been also revoked, the initial will can be valid in court and the estate and assent allocation can commence. If the original document cannot be located at all, an individual or a party could apply the Court to probate a copy of the dependent’s will. Before a copy of a will undergoes probate, however, there are several things the individual or party must consider. First, that there is at least a chance that the decent destroyed his or her will on purpose. Additionally, it depends on all the heirs to an estate during the probate process. 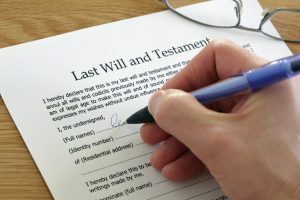 If all the heirs agree that a copy of the will should be probated, it should be a relatively smooth process. If, on the other hand, one or more beneficiaries of the estate object to this process, there will be more complications. In this case, the proponent of the copied will document must provide clear and convincing evidence that the will was either misplaced or was not intended to be destroyed. DISCLAIMER: the above information is not professional legal advice and anyone dealing with these issues should consult with a professional attorney directly to discuss the specific details of your and your family’s situation.